Throughout his presidency, John F. Kennedy was passionate about the issue of immigration reform. He believed that America is a nation of people who value both tradition and the exploration of new frontiers, deserving the freedom to build better lives for themselves in their adopted homeland. 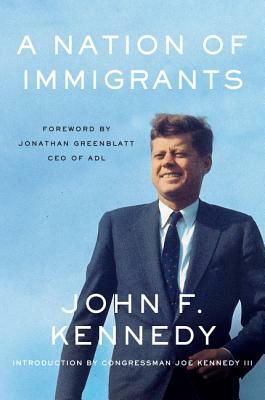 This 60th anniversary edition of his posthumously published, timeless work—with a foreword by Jonathan Greenblatt, the National Director and CEO of the ADL, formerly known as the Anti-Defamation League and an introduction from Congressman Joe Kennedy III—offers President Kennedy’s inspiring words and observations on the diversity of America’s origins and the influence of immigrants on the foundation of the United States. John F. Kennedy (1917-1963) was president of the United States from 1961 to 1963. At forty-three, he was the youngest man ever elected to the Oval Office and the first Roman Catholic president.